With the launch of new Tectoy’s Mega Drive approaching and the celebration of 30 years of partnership with SEGA, we decided to go deeper in the Tectoy history and talk with some of the company’s great people and developers. 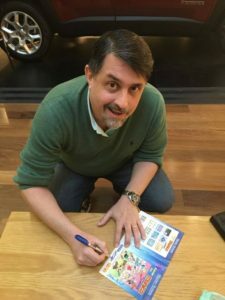 To start this series, today we are interviewing one of the main figures behind the success of Tectoy in the ’90s: Alexandre Pagano. SEGA Nerds: Good morning Alexandre first of all it’s a honor to speak with you, your work was part of the childhood of many people here in Brazil. So for outsiders who don’t know your work, let’s start with the basic. Who are you? Where you are from? And what do you do as a profession? Alexandre Pagano: I’m Brazilian, born in São Paulo capital on Dec. 30, 1968, so I’m 48 years old. I am happily married, and I have a 25 year old son. To talk a little about my professional career we have to go back a little in time … actually quite lot [laughs]. In 1974, when I was only 6 years old, my parents took me to see the Orlando parks. I was amazed by such technology, beauty and all the wonders created by Walt Disney and his entire team. The designs and animations have always fascinated me and since then I have known that I would work with animation. A few years later, when I was in college in the ’80s, I started working in an animation studio called HGN. This studio was outsourced from Disney Studios, where we did some short films. Goofy and his gang, DuckTales, and the coolest of all, the Gummy Bears. It was a very important experience because, as the computers at that time were still a very, very expensive resource, we worked with the traditional animation, that is, frame by frame, 24 frames per second, acetate painted manually and then photographed frame by frame. It was at this time that I learned all about animation. A great school! SN: How and when did you join Tectoy? Pagano: In 1990, it was very difficult to continue in the ​​animation area, and unfortunately, this is a very underpaid area. My father, who worked in the Tectoy sales department, told me that they had a vacancy for a promotion assistant and that paid a lot more than I was earning at the time. As I had to pay my tuition fees in the design course at the Faculty of Belas Artes in São Paulo, I left the animation area and went to work in the promotions area of ​​Tectoy. One of my activities was to respond to letters from children who had doubts about the Tectoy toys. The biggest demand at the time was how to go from certain stages in the Master System games. So, to answer these questions, I had to play the games until the end. At one point, the children did not want to wait for the mail, they wanted the answers as quickly as possible and started calling Tectoy. When the lines started getting congested, I spent more time answering tips than doing other activities. Marketing management decided to absorb me into a new hotline department, which served as a direct channel to answer questions about Tectoy games. As the demand increased, more and more attendants were hired, and they had the tips in individual notebooks, but the tip books didn’t have a response pattern. So I decided to make a folder with all the tips presented in a standardized way, with a unique language, clear layout, clean and very technical – this helped when responding to the doubts of our customers. At a given moment, the number of games released was quite high and the complexity of the games increased every day. It became increasingly difficult to play and answer calls. We were no longer having fun; we had deadlines, goals, etc. It was at this point that I spoke with my manager at the time, André Goldfarb, suggesting that we had a gaming expert, and I was applying for this vacancy. Thus, in the middle of 1991, Tectoy created the Games specialist position. At that point, I had never even played tabletop RPG, much less a digital version. We were in the ’90s, we had no internet, and while Phantasy Star was known in the rest of the world, it was entirely new to us. I played and loved the game, but my opinion was that if it wasn’t translated, people would not play it. This was evaluated, and, to my surprise, I was tasked with assisting in the translation project of the game that went on to take about three months of work. The reverse engineering work done by engineer Claudio Oyamagushi made it possible to not only to find the text characters but also the graphic characters. This meant we could get games that had not been released to change the characters and adapt games to our market! After translating several games, the whole team began to be dissatisfied … we wanted to make a game from scratch. After several marketing negotiations with copyright, we got the authorization to make a game of the character Pica-Pau (Woody Woodpecker in U.S). Based on the concept of animation, we started producing the Pica-Pau game (it would go on to be known as Woody Woodpecker’s Frustrated Vacations) that had the secret name of “Asdrubal Trouxe o Trombone,” the name of a Brazilian Jazz Funk band from the time I had just watched a show. As the name was too big … It was only Asdrubal. After approving the script written by Jaime and Sandra Chemmin, we started to design the Memory Map, which is essentially a storyboard of the game. Once that was done, we fleshed out the animations and the game’s graphics, backgrounds, sound effects and the soundtrack. While this was going on, another team worked on the structure and programming of the game. This team was managed by Claudio Oyamagushi, and had programmers Marcelo Caiado, Luis Campello, Mauricio Guerta, among other beasts of the programming area. We finally finished the game in November 1995. SN: When did you leave there? Pagano: I worked at Tectoy until Jan. 2, 1996. SN: Which projects did you work on while at Tectoy? 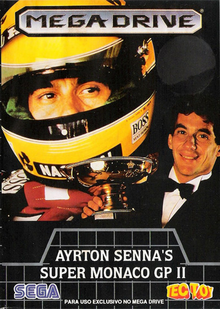 17) Super GP Monaco with Ayrton Senna. There were more projects, but my memory is not the same … a type of bank-line that accessed the account of Game Gear users through dial-up line. SN: Which project was the hardest to complete, and which one are you most proud to have done? The most complex work that made me proud was undoubtedly Pica-Pau’s game. The most satisfying, which I have no doubts was the adaptation of the game Monica to the Mega Drive, it was one of the most beautiful we did. 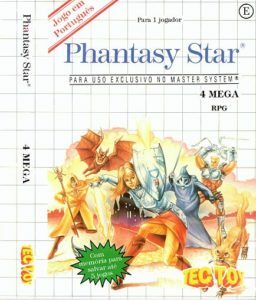 It would be unfair not to include the Phantasy Star translation because without it I would not have gone into the development of games. SN: How was working at Tectoy in that golden age? Did you have much contact with SEGA? Did they evaluate your work? Pagano: Working at Tectoy at that time was very satisfying. Everyone is proud to have worked in what was the biggest technology toy industry of the 1990s. We were a big family. Contact with SEGA was minimal, and it was done only by the marketing department. Unlike today, the language barrier was also a problem. Few people spoke English, and it made it difficult to communicate with SEGA, which was very closed off at the time. SEGA did not evaluate our work and also did not help … We had no software, books, support, basically nothing. Everything, absolutely, everything that was done and created by Tectoy, was developed and created by its collaborators. Remember again that we did not have Google, YouTube, or the Internet at that time … nothing! We took blood from stone! We were a very tight team and very talented! SN: Is there any project or something that was started within Tectoy but has never been finalized that you can share with the public? Pagano: It was a very dedicated company; when we started a project, it always went to the end. I think the only project that did not go forward was the development for the SEGA Saturn, which was considered, but we didn’t begin the development. 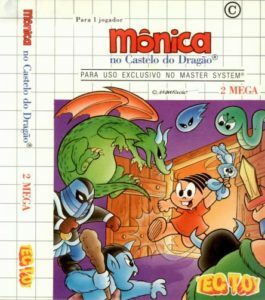 SN: With the launch of the new Mega Drive, many Brazilian fans are asking Tectoy to relaunch the Monica Gang. Because it’s a project that you participated in, how do you feel when you see the game receiving so much affection even after so much time? Pagano: I never would’ve imagined these old project I did would be remembered as they have after all these years. They were just games, and I didn’t realize that they would have such a big impact. Everything I do I always try to do with a lot of attention to details and give my best. But I always think we all try to do this, don’t we? Every time someone recognizes, praises or even criticizes our games, for me, it’s a great honor. Because knowing that somehow I could contribute to the entertainment of a group of people and that they had any kind of good or bad opinion, it makes me feel extremely flattered. Having the opportunity to be a digital artist in the ’90s and collaborating with the learning curve of a generation that bridged the digital generation of today, only makes me proud. SN: What is your favorite console? And the favorite game? Pagano: Nowadays, due to lack of time, I’m no longer a regular player, but my family is very technological as you must be imagining. We have almost all the new generation of consoles, Wii U, Switch, PS3 and 4, and Xbox, among others. It gets very difficult to talk about X or Y console because each one has its own characteristics and particularities that I love. The most nostalgic without a doubt is the Atari. What gave the greatest technology step was the Master System. The most entertaining was the Nintendo 64. The one that had greatest variety of games was the PlayStation 1. But the console that lives in my heart still remains the Mega Drive. It’s unfair to be able to talk about just one game, so I’ll pick five, OK? 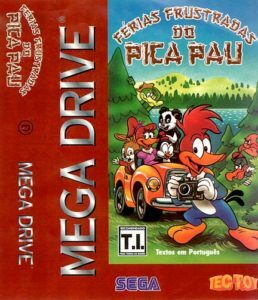 #4) Férias Frustradas do Pica-Pau (Frustrated Holiday of the Woodpecker). I think these five were the games that made the most of my life! SN: What did you think of Tectoy’s new Mega Drive? Pagano: I didn’t have the opportunity to evaluate, but knowing the visionary look and the great entrepreneur that is Stefano Arnold, I’m sure it will be a great console. SN: What advice would you give to someone who is just getting started in the industry? Pagano: Learn from the past to create an even better future. The secret of successful games is still in our essence, that is, as much as we create extremely innovative technologies, we will continue human beings. Games create communities that allow for competition, and the eligibility of leaders, regardless of gender, will continue to be the next success of the market, regardless of console, graphics quality, gameplay or other specific characteristics. Would you also like to leave a message for Tectoy and SEGA fans? I’m a fan of yours, and thanks for the opportunity! I feel honored and flattered to be able to tell a little of my history, our history.